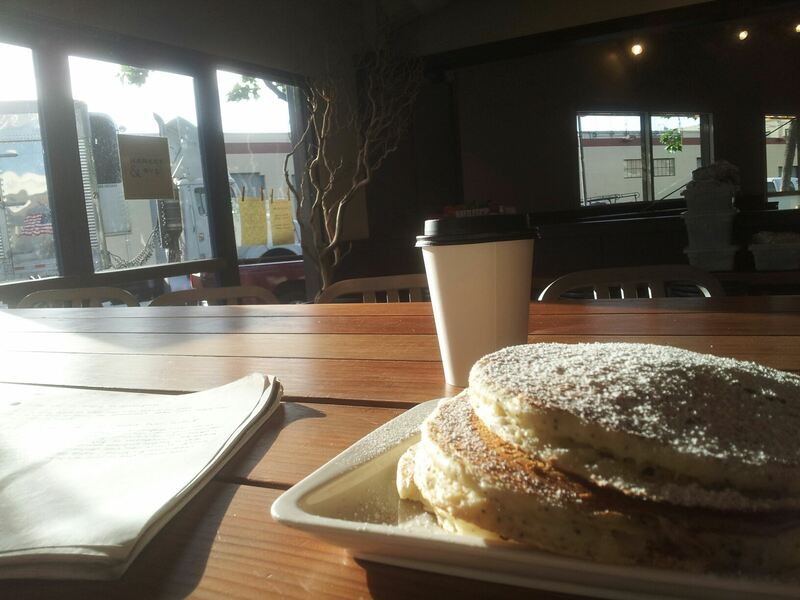 Over the past year, I’ve eaten breakfast at 43 different restaurants in the Bay Area. Every Friday morning, I wake at the godly hour of 5:15 am and leave the house by 6:30 to go eat breakfast at 7:00 at a new restaurant – always a new restaurant. Every time, to what extent possible, I get breakfast meat, pancakes, hashbrowns, eggs, coffee, and toast. It’s a feast for one, for my heart and soul. Do you know what color the sunshine is on Friday mornings at 7:00 am as it streams over a short stack of pancakes? It’s butter. It’s clarified butter. It’s ghee. Listen here – the hours between 5 and 7 am are a secret. No one knows about them, and during those hours the most extraordinary things occur. Different buildings appear and familiar ones change shape. Houseboats float in the air next to colorful songbirds, and both are feathered and free. The morning streets are gleeful, speaking with each other in excitement about the coming day. AT&T park enjoys its morning coffee before being filled up with and vomited on by Giants fans. The Embarcadero bends and sways in a morning song before it’s drowned out by business heels tramping to their desks. And if you’re out at that hour, you’re one of the lucky ones. You get to see the other side. Restaurants are magical in the morning. Only the most faithful, the most loyal patrons are present, eating their usuals. The staff is chatting with each other, getting ready for the day. Everyone is at their best. There’s no anger, no stress. Everyone sighs in bliss together. A plate of pancakes at 7:30 am is unlike a plate of pancakes at 11:00 am. Corned beef hash at 7:19 am is unlike corned beef hash at 11:02 am. The former is a treasure, the latter a commodity. The former is enchanted, the latter ordinary. Restaurants that open at 6:30 and 7 am love their patrons and open early for that reason, to serve them the food they need to get to where they’re going. Sometimes the upholstery on the booths is cracking and the stuffing is coming out. Sometimes the decor made up of dusty fake plants and faded Polaroids on the wall, but at the best of places, this all points to a love of people. And what could make the food taste better than brotherly love? I have an unmitigated love for magic breakfast. Each time I get up and venture into the morning world, it’s the best experience of my life. When others hear me speak of my breakfast love and of my many adventures, they often ask me which one was my favorite. I instantly freeze up and have no idea how to respond. What do they want me to tell them? Where they can get the best food? The most pleasant atmosphere? The edgiest cuisine? The cutest waiters? Am I a god that I should judge these things for other people? For me, the hot stack of 7:25 am pancakes in front of me is always the best food I’ve ever tasted. The snaggle-toothed, wide-hipped waitress with a bad dye job is always the most beautiful woman in the world. A mostly empty restaurant with yellowing posters of Hawaii on the wall is always the most incredible atmosphere I’ve ever experienced. The gentle song of coffee refills, newspaper shuffling, and morning phlegm-clearings is always the most lovely music I’ve ever heard. Come with me one morning at 7:00 am, and maybe you’ll see what I see too. Until then, be wary of asking me for restaurant recommendations. They might not prove as useful as you might guess. You should take a breakfast vacation, just for once. In the days of my wasted youth, even after late nights (which was most), I liked to get up really early, go eat breakfast and watch the day start. Then lumber back to bed. I’ve done that before – I love how breakfast ends up feeling like a dream, which is quite appropriate, when you think about it. Mornings are definitely magical. It’s the only reason I don’t hate that I wake up – naturally – between 4:30-5:30 every day. I don’t have to be to work until 9am and my commute is only 10 minutes, but there is a fundamental part of me which will not let me pass on the morning. And – where I live – Sunday mornings are the most magical because they start earlier and last longer, as if the world has slept, dreamt of magic, and awoken rested and ready for another week. To be you for a day….wow. great post! there’s literally nothing better than being out on a quiet morning in the city before everyone else…total bliss. I haven’t! But I have tried those biscuits – quite delicious. Great with a cuppa coffee! You are, indeed, the Breakfast Whisperer. My go to breakfast is two eggs, basted, corned beef hash, hash browns and white toast. A never ending cup of coffee and a good book complete the meal. What a beautiful post. That sounds incredible. I can’t wait for Friday.